Equipment rental, also called plant hire in some countries (in the UK for instance), is a service industry providing machinery, equipment and tools of all kinds and sizes (from earthmoving to powered access, from power generation to hand-held tools, etc.) for a limited period of time to final users, mainly to construction contractors but also to industry and individual consumers. Equipment rental is a relatively new industry, first developed in Anglo-Saxon countries. 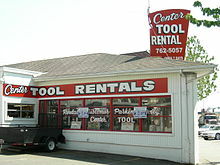 The American Rental Association was founded as early as 1955, and the first waves of consolidation took place in the 1970s in North America, leading to the creation of companies with nationwide operations. Consolidation was slow in the 2000s but a buyout joined the two largest North American rental companies: United Rentals and RSC. Europe is catching up since the '80s. The industry has moved from mostly family-owned small businesses to the creation of a number of international groups, some of which have an annual turnover close to €1billion. 40 of the 100 largest equipment rental companies in the world are European. The majority of companies in the industry still have fewer than 5 employees. Concentration in the industry is expected to renew at a fast pace, following a pause in 2008–2009 as a consequence of the international credit crunch. The situation of the equipment rental industry in Europe varies from one country to another, with some markets being more mature. Equipment rental penetration is lowest in Italy, Spain and Poland and highest in the UK and the Nordic Countries. The potential for growth is important in Southern, Central and Eastern Europe, where some countries saw a double-digit growth rate for rental in recent years. Capital Release: In times where they have to demonstrate high levels of profit compared to invested capital, contractors are increasingly eager to rent equipment, as it allows them to minimize the size of their equipment fleet. Less immobilized capital allows for improved cost control, lower maintenance costs, and a reduction in transport fleets. Renting equipment with operators allows for optimizing staff costs. Range of recent equipment available: Some rental companies have inventories up to the hundreds of thousands of pieces of equipment, while others are specialized in a few specific products. They can supply the most comprehensive range of state-of-the-art equipment – with or without qualified operators – when and where customers need it. Maintenance, compliance with standards and regulations: Rental companies bear the responsibility for ensuring the equipment they rent out complies with applicable regulations, performing safety check before delivery. Routine maintenance and major repairs are typically handled by the rental company, saving the renter the expense of having a maintenance crew on staff. Safety checks are performed before each delivery. In 2013, rental revenues in North America were expected to exceed $38 billion and industry growth is expected to outpace the general economy. As of 2013,[update] the 20 largest rental companies were all headquartered in the US. The European rental industry, through its representative association ERA, has published a MANIFESTO for the Promotion of the sustainable Benefits of the Rental Concept. - The centralised ownership leads to a more frequent hence more efficient use of equipment. - The rental companies ask for increased information on product repair from the equipment manufacturers. - Rental companies search for equipment to offer the most sustainable option to their customers. - Rental companies provide theoretical and practical trainings to their customers to optimise the use of equipment. - Components of the dismantled construction equipment can be reused. - Selling it to second hand markets, if it complies with regulations. - Rental companies use their bargaining power to demand equipment suppliers to invest more in R&D to limit the use of non-recyclable material, and take responsibility for end-of-life of equipment by collecting, reusing or recycling. In 2016 the ERA (European Rental Association) published the ERA Market Report, based on a research carried out in 15 countries (Austria, Belgium, The Czech Republic, Denmark, Germany, Finland, France, Italy, The Netherlands, Norway, Poland, Spain, Sweden, Switzerland and the UK). According to this study and previous research on countries not included in the study, the total size of the European equipment rental market without operator was €25 billion in 2016. In the 15 countries surveyed, 15,500 companies were active in rental in 2016 and they collectively employed 120,000 people. ^ "Who We Are". Ararental.org. Retrieved 2 January 2015. ^ "Reversal of Fortune". Rermag.com. Retrieved 2 January 2015. ^ Gene Marcial (19 December 2011). "Smart Buyout Deal By United Rentals Delivers Rich returns to RSC Holders". Forbes. Retrieved 2 January 2015. ^ "North American Rental Revenue to Reach $38 Billion in 2013". ForConstructionPros.com. Retrieved 2 January 2015. ^ "RER 100: Top Rental Equipment Companies of 2013". Rermag.com. Retrieved 2 January 2015. ^ "ERA Market Report 2016".